I know, I know.. Ted and Robin are meant to be together. They are soulmates. That is what their shippers are gonna say! But it will always be the yellow umbrella for me instead of the Blue French Horn. Much of HIMYM centered on Ted Mosby’s long quest for true love. And of course, Marshall and Lily are the synonyms of relationship goals. Nothing beats those two college sweethearts! 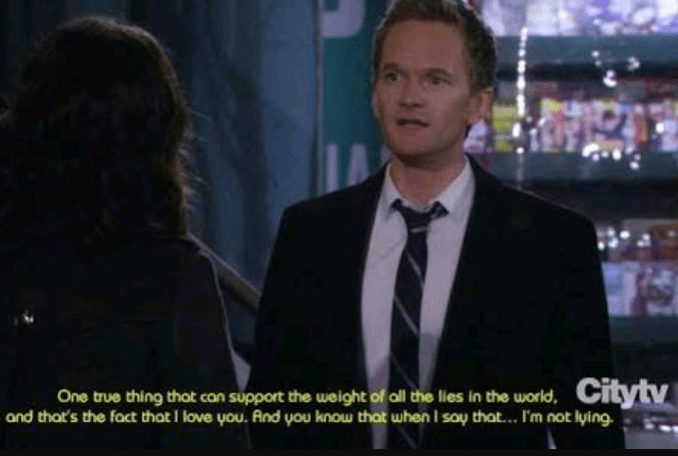 But what most HIMYM fans tend to ignore is the fact that Barney and Robin were the second most awesome couple in the series. I know this is not gonna go well with Ted and Robin shippers. So, I have narrowed down 20 LEGEND–WAIT FOR IT– DARY Barney Stinson love quotes. If you read all of them till the end, I am sure that it will make you fall in love with Barney and Robin all over again!